Plan Toys is testament that it is possible to maintain imagination, play value, and superior quality standards – all while steadfastly following a path of environmental and social responsibility. By constantly pushing boundaries in its innovation processes, the much-loved toy company admirably passes on the spirit of Sustainable Play through its ideas, culture, design process, and various methods of Reducing, Reusing & Recycling – resulting in meticulously designed toys that are not just interactive, fun, and flexible; but also responsive to the developmental needs and circumstances of our children and the environment. The educational merits of Plan Toys are recognized by some of the most prestigious awards in the industry, including but not limited to the German Spiel Gut Award, the Parents' Choice Award, the Practical Preschool Awards, and the Oppenheim Toy Portfolio Award, among many others. By implementing best practices that far exceeds the toy industry standards, Plan Toys has truly taken the art of toy making to the next level. It is famously known as the first company in the world to manufacture wooden toys from preservative-free rubberwood; and today, still manufactures toys from natural rubber wood trees that no longer produce latex. To keep the wood pure, no fertilizer is added to the soil three years prior to its usage; and the wood is further strengthened using a chemical-free kiln-drying process after the trees are cut. All Plan toys are also assembled using a certified E-zero formaldehyde-free glue in place of traditional wood glue, and are coloured using only non-toxic, water-based dyes and organic colourants. Only recycled paper and soy ink are used for printed materials; both of which are readily biodegradable and can be recycled more efficiently. 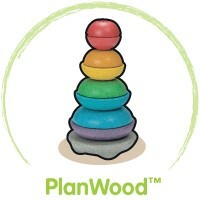 PlanToys is certified under the FSC chain of custody (CoC). This certification tracks FSC-certified material through the production process- from forest to customer- and includes all stages of processing, transformation, manufacturing, and distribution. Quality Assurance is also conducted with state-of-the-art equipment at an on-site laboratory prior to sending toys out for third party international testing. All of its toys are EN71 and ASTM-tested, and is also ISO9001 and 140001-certified, the latter being a certification for environmental management. PlanToys also strives to be Carbon-Netural by planting trees to offset the amount of carbon dioxide released during manufacturing. Surplus wood pieces from production are also used in their Biomass generator to produce electricity for the whole factory and villages around it. With a strong mission to create a more sustainable world, Plan Toys has also grown its Green values into the very values for Sustainable Play. To date, the Plan Toys Reforestation Program has seen more than 51,020 trees given back to nature – each time a tree is reclaimed for its wood material, one is grown back in the plantation as replacement. Various projects and initiatives such as the PlanToys Children's Museum, Children and Community Club, the Sarnsaeng-Arun Culture and Environment Foundation, and Mom-made Toys Project, also see the company uphold their corporate social responsiblity by providing meaningful experiences and work programs for those in need within their community. In a bid to move forward with their commitment toward sustainable play, the Plan team developed and launched a new eco-friendly material in 2012: PlanWood™, a non-toxic composite wood made from sawdust and waste wood produced during the manufacture of the toys. Molded and compressed at intensive pressures, PlanWood™ is stronger and more durable than normal rubberwood, without use of any heavy or toxic chemicals. Because of the amount of pressure applied during production, very little glue is also needed to bind the sawdust together: believe it or not, less than 1% of formaldehyde-free E-zero glue is used in the process. Also, due to its unique composite nature, organic colourants can also be added in the process, making it more eco-friendly than non-tested dyes or even soy- or water-based inks. Parents will especially love that toys made from PlanWood are also highly water-resistant, making them dishwasher-safe – a big plus point for wee ones who can’t resist putting everything in their mouths.